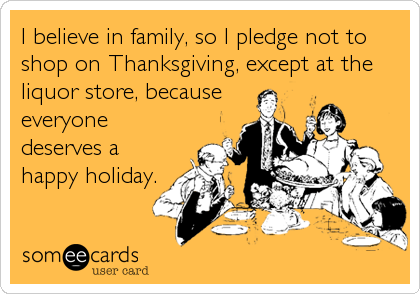 Pledging not to start your Holiday shopping on Thanksgiving Day seems like a worthy thing to do, right? It's meant to be a day for gratitude and family. To make yummy food together, eat it, clean it up, have seconds, have pie, watch football or a movie and just SPEND TIME with those you love. You shouldn't be itching to get out the door to the local mall for scrambling and brawling over the latest hot toy for your kid or grandkid. The next day, Black Friday, is soon enough for all of that. I won't be starting my Christmas shopping ON Thanksgiving. But it's not because of some pledge. I simply don't feel the need. The idea that no one shopping on Thanksgiving would mean that stores would stay closed and employees of said stores could stay home with their families is all well and good. Noble even. You think it's greedy? Maybe it is. But here's the thing: there are plenty of reasons someone might WANT to work on Thanksgiving. Maybe they could really use the extra money for THEIR Holiday shopping. Perhaps they don't actually have any family to spend the day with and sitting home alone would just be depressing. Maybe they don't care to celebrate Thanksgiving, or they choose to do their feasting on another day. Two of my friends have already had Thanksgiving dinners with portions of their families because it worked out better for everyone. 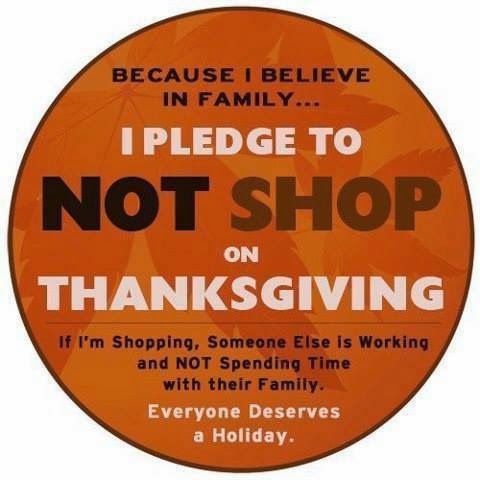 There are just as many reasons why someone would want to go shopping on Thanksgiving. Many families have their meals early in the day. Maybe the women (stereotypically) don't want to watch football after dinner. Why not let them go out? From what I can tell, those who go out for the best deals of the year do so with family members. They're still spending time together, aren't they? Look, I just think that if you have a moral issue with stores being open and people shopping in them on a holiday, then don't partake. There doesn't need to be shaming or guilt involved (or some stupid pledge) for those who are working or shopping to carry. What other people choose to do with their holiday is up to them. You think this will help the poor retail worker? It won't. From what I understand, they volunteer to work a holiday. For the extra money they can put in their pockets. If they choose it, and still want to celebrate Thanksgiving, they will find a way. And remember, it's really none of your business. People make the choices they need to make for themselves. Why do you need to get so worked up about it?